The Army is only as good as its soldiers, so mental well-being is as essential as physical fitness. As a military clinical psychologist your aim is to reduce psychological distress, and to enhance and promote psychological well-being by the systematic application of knowledge derived from psychological theory and research. It’s your job to provide professional psychological assessment and treatment to those who need it as part of a military multidisciplinary mental health team both in the UK and overseas. Clinical psychologists are more than psychological therapists: you will use your research competence to critically evaluate research publications and, when required, design and carry out applied research and audit. Your specialist clinical skills and experience will give you the edge when supporting your mental health colleagues and others through provision of clinical supervision and training. In July 2012 the British Army opened its doors to clinical psychologists becoming commissioned officers. These posts were advertised on The Psychologist jobs website www.psychapp.co.uk and I applied with a sense of curiosity and intrigue. After a long and uncertain 12-month selection process, I had the privilege of becoming the first commissioned clinical psychologist in the British Army and at present remain the only uniformed clinical psychologist across the whole of the UK military. These are my personal reflections on the role and my time in the post so far. The first stage of the recruitment process was attendance at a two-day acquaint visit at the Army Medical Headquarters Camberley, at which I was given a full briefing and introduced to the infamous Army Personal Fitness Test. I then travelled down to Westbury to complete the Army Officer Selection Board (AOSB). This was a three-day formal selection course, a requirement for any potential army officer. The AOSB tested me in every way imaginable and took me completely out of my comfort zone. It highlighted my strengths and weaknesses in a way I have never quite experienced before. Indeed, one of the main objectives was to evaluate my ability to cope under pressure, which it certainly did. Several months later I attended the Army Interview Board. This was a more familiar interview process, involving a number of senior officers from different strands of the British Army. Following successful interview I was offered a commission as a Captain after completion of the Professionally Qualified Officer’s Course at the Royal Military Academy, Sandhurst. This was an 11-week course that equates in essence to the final term of Regular Army Officer Training. It taught me military skills, tactics and strategy, military history, leadership and command responsibilities and tested my physical fitness and mental resilience throughout. I then spent a month at Defence Medical Services Training Group, Keogh to complete my Entry Officers Course, which was a specialised medical training course. During my first year in a busy Department of Community Mental Health at Catterick Garrison, my main effort has been getting up to speed clinically. To put it in perspective, if we were to use a stepped care model then we cover primary care right up to step five (specialist/inpatient services). Therefore, the variety of work is immense. Moreover, due to a number of different factors, for example, the demands of military service, the constant moving around of personnel and some of the barriers to help-seeking, the constant challenge of engaging and keeping people in therapy is a critical task. Another main component of my role has been preventative, and I have sought opportunities wherever possible to promote mental health education and training. One positive area has been the development of mental resilience training within the military, and this is an area I am exploring further with research. I have been asked by many clinical psychologists ‘What are you first, a psychologist or army officer?’; I reply ‘Both’. Indeed, I have found it possible to step in and out of the roles in different situations – to effectively wear two hats. In the words of George Kelly I have not felt as though I have been slot rattling between two polar opposites. During my military training I had to step out of the role of being a clinical psychologist, as first and foremost I was being assessed on my potential to be an army officer. However, I was able to retain a sense of autonomy and competence by using skills that I have developed as a psychologist, such as problem solving, reflexivity, flexibility of thinking, interpersonal skills and relationship building. I also used many of the psychological skills I teach in therapy in order to cope with the stress, pressure and demands of training. In contrast, in my clinical role, I am first and foremost a clinical psychologist and where possible leave the military etiquette at my door. I imagine that inside my therapy room it works like most therapy rooms up and down the country. In a similar way I have also been able to apply the leadership and personal skills I developed in my officer training to enhance my role as a psychologist. It has not been all plain sailing and there have been some ethical dilemmas to negotiate, in terms of confidentiality and the occupational requirement. However, it has been possible to resolve these through supervision, consultation with my military colleagues and personal reflection. Of course, I am not blind to the fact that on operations the potential ethical dilemmas are likely to increase significantly… I will be more firmly placed in my officer role and there will be far less black and white, and a whole lot more grey. One of my other main reflections has been the extent to which the military identity has influenced my thinking, behaviour and emotions. Wearing a uniform has meaning. There are no two ways about it. Once you put it on you become part of something, part of an organisation’s ethos, history, culture and way of life. There is a very strong identity associated with being in the military and during my time in phase 1 and 2 training I definitely internalised the military culture and set of standards and values that so strongly underpins it. Perhaps, due to the fact that I am a psychologist, but also because I remain in a unique role, I have reflected a lot on the influence of culture and organisational and individual identity within the military. Indeed, having worked as both an MOD civilian trainee clinical psychologist and uniformed clinical psychologist, I feel that being in uniform has given me greater insight into the military mind-set, culture and identity and has enhanced my clinical work considerably. Militarily speaking, one of the most rewarding experiences was the time I spent at Sandhurst. I have fond memories of this and made some lifelong friends. It held true to everything I had heard and read about this prestigious and impressive institution. It lives and breathes history, tradition, pride and excellence. 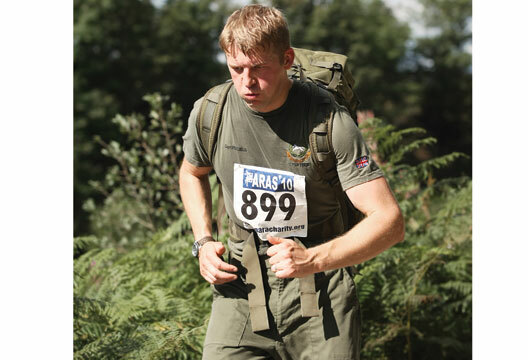 Since then, my proudest moment has been to pass the extremely arduous and physically demanding pre-parachute selection course and earn my paratrooper wings to enable me to serve alongside the elite parachute regiment.The low point was the amount of time I spent away from home in my first year of training. In 2013 I was away for over five months. My wife was pregnant, also looking after our two daughters and working full time. She had it much harder than I did at Sandhurst, and this gave me an insight into what military personnel have to contend with on operations. I had not experienced such a profound sense of homesickness before, and I am not sure I could ever get used to being away from home for this long. Trying to focus and concentrate, whilst always in the back of my mind thinking about what was happening at home and how my wife was coping, was a difficult experience. Ringing home and finding out when things were going wrong, I felt helpless in being unable to do anything about it… it made it seem as though I was shirking my responsibilities as a husband and father. Most NATO countries have regular or reserve uniformed clinical psychologists in at least one branch of their armed services (Army, Navy, Air Force). In relation to our closest English-speaking allies, the United States Military and Australian Defence Force have well-established psychology corps. The US have uniformed clinical psychologists across all three of their armed services. The influence of the uniformed clinical psychologist reaches more than just a clinical role as they are deeply embedded within their chain of command. They also have unique occupational roles, completing psychological screening measures and assessing personality, intelligence, aptitude and mental well-being in order to select personnel for highly specialised roles. This highlights some of the potential areas for development of uniformed clinical psychology in the UK Armed Forces. It is a time of unprecedented change within UK defence with the significant reduction in the size of the armed forces. Change creates a degree of uncertainty when it comes to the longevity and sustainability of a new role. Nevertheless, the priority for me remains: to make a difference to the lives of the people that walk through my door and, on a wider level, to establish and demonstrate the unique role uniformed clinical psychologists can play in the firm base and on operations. In sum, the last two years have been packed full of variety and challenge. I am incredibly proud to be applying my trade in support of our brave service men and women, and to have experienced the opportunity to be part of something very exciting and historic for my profession. We are recruiting more uniformed clinical psychologists, and I can honestly say, in terms of the variety, challenge and opportunities that I have experienced, it is an incomparable setting to work in. A fascinating read thank you! As a psychologist and with family links to the army I can relate to the dual role of military identity and reflective process. I attended the BPS (Wessex) Military Veterans conference at Sandhurst in 2012 and am interested in psychological well being both in the forces and in transition for after forces life. Captain Precious' account further informs on this topic.